Novartis AG on Thursday announced that it was selling its generic U.S. oral solids and dermatology portfolios from Sandoz U.S. to Aurobindo Pharma based in India for the price of $900 million, as the drug maker, based in Switzerland, will focus on it higher growth areas. The agreement includes close to 300 products as well as other development projects at Sandoz and another $100 million for performance-based payouts, said Novartis. Shares of Aurobindo were up over 5% following the news, while Novartis shares were little changed during early trading on Thursday. One analyst in Switzerland said the sale was not surprising, but a price 1 times sales was expected for the transaction which did not take place. The analyst added that pricing pressure in the generic market in the United State is greater than first anticipated, as revenue last year were $1.5 billion at the business and the first six months of 2018 have had sales of just $600,000. The unit of Sandoz was hurt due to price pressure in the U.S. which prompted CEO of Novartis Vas Narasimhan to sell part of the Sandoz unit. 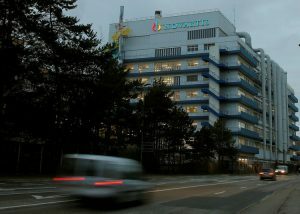 To date, Narasimhan has said that the remaining businesses in Sandoz remain part of the Novartis core. He will keep the Sandoz biosimilars business as well. Biosimilars are less expensive very close copies of complex biological treatments whose patents are expired. The CEO is hoping that increasing demand from governments strapped for cash and insurers that seek to contain their costs will help the unit boost margins. Earlier in the year Novartis said it wanted to sell Sandoz after posting sales that disappointed from that unit. CEO at Sandoz Richard Francis said that through the transactions the company is refocusing its business but striving as well to ensure the continuity of supply of long-used important generic medicines for clients and patients in the United States. Following this transaction, the portfolio of Sandoz U.S. will remain substantial and included value-added medicines, complex generics like ophthalmic, respiratory and injectables as well as its biosimilars said the company. The transaction positions Aurobindo as the second biggest dermatology player as well as the second biggest generics business in the U.S. by prescriptions, said Aurobindo Pharma USA managing director N. Govindarajan. Nearly 750 employees along with field representatives for dermatology business PharmaDerm will transfer to Aurobindo when the deal closes said Novartis.